The supporting cast in the radio series were essential in creating the right atmosphere for the shows, and they supplied plenty of comic relief.. A lot of them were also film actors as well as performers on the radio, with some being particularly talented character actors. 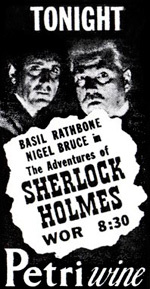 Other members of the crew such as sound-effect technicians and musicians were also instrumental in making The New Adventures of Sherlock Holmes such a successful and enduring series. The actor's roles are listed below for each member of the supporting cast. They have been inferred through repeated listening to the episodes, along with other OTR shows and watching old films to get an ear for the faces and names behind the characters. I have garnered some of the information myself but most of the credit goes to Cameron Estep, and a huge thanks goes to him for all his help. This is not a definitive list, I expect it to be updated and expanded as time goes by. Well known Scottish actress who lived in the United States for a long time. Gordon specialised in portraying housekeepers and mothers, most notably the landlady Mrs. Hudson in the Sherlock Holmes series. She appeared in almost 300 films between 1925 and 1950. British stage actor Frederick Worlock came to Hollywood in 1938. During the war years, he played many professorial roles, some benign and some villainous. Worlock was a semi-regular in Universal's Sherlock Holmes series, and appeared in 81 films and 37 television series/shows. His final role was a voice-over in the Disney's 101 Dalmatians. British character actor Rex Evans came to Broadway in the 1930s. After making a strong impression as the family butler in The Philadelphia Story, he found himself typecast as a dignified manservant. Occasionally he broke this stereotype by adopting a moustache and playing such roles as the grumpy landlord in Frankenstein Meets the Wolfman, and the leader of a trio of villains trying to assassinate a king in Pursuit to Algiers. American actor, primarily in radio from the 1930s through the 1950s, and appeared in scores of programs from radio's Golden Age, such as Suspense and the Lux Radio Theatre. Merrill was a versatile voice actor who could play everything from heavies to comic roles, excelling at dialects. A piano prodigy, Norma Varden studied in Paris and appeared in concert in England as a teenager. As well as a radio actor, Varden played the Von Trapps' housekeeper in The Sound Of Music. American voice actor and character actor, with a four-octave voice range. Frees was a prolific performer, and in one role he provided much of the falsetto voice for Tony Curtis' female character Josephine in Some Like It Hot. 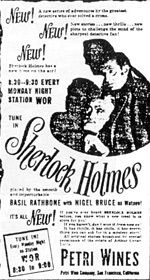 Radio actor who made occasional films, but only received a screen credit in two films - one role as as the sailor who tries to play the piano and ends up cutting his hand in Sherlock Holmes Faces Death. Once played Marley's Ghost in Rathbone's first recording of “A Christmas Carol”, and starred in a 1947 radio adaptation of Kipling's “The Man Who Would Be King”. Von Eltz was silent screen lead and a polished radio actor who matured into a dark and dashingly handsome film actor. At the advent of sound, Von Eltz was comfortably playing character parts and was often called on to play a menacing supporting role. By the late 1930's his billing had fallen to the point he was often uncredited, but he did have a small but integral role in the classic film noir The Big Sleep. Ellis started in Hollywood as an actor and writer, and counted episodes of Escape in his extensive writing career. He also directed Escape episodes and later directed Romance, Suspense, The CBS Radio Workshop, and Frontier Gentleman. A youthful sounding voice helped Bartell become one of the busiest character actors from the 1940s until the end of network radio drama in the 1960s. Appeared on shows like Gunsmoke, Johnny Dollar, and Frontier Gentleman among others. His final appearance on radio was was on Jim French's series The Further Adventures of Sherlock Holmes in 2003. Radio and television actress who is best known for her role as Bambi's mother in the 1942 film Bambi. When actress Jean Harlow died during the filming of Saratoga in 1937, the film was finished using Winslowe as a voice double. British film actor who entered the film industry during the final stage of the silent era. Harbord later went to Hollywood where he played supporting and minor roles, including a Scotland Yard Inspector in Sherlock Holmes and the Secret Code. A former circus performer, and although primarily a dramatic actor, he proved his comic flair in the 1910's. Rawlinson was a leading man in Hollywood's silent era and he later worked for Hal Roach in the 1920's. In sound films thereafter, he was a character actor. Best known on radio for playing the creepy sounding Man in Black on the famous mystery series Suspense. Built his home around a pipe organ, and prior to becoming a well known Old-time Radio actor, Kearns had a career as a theatrical and OTR pipe organist. Famous for portraying Professor Moriarty to Basil Rathbone's Sherlock Holmes. With Anthony Boucher, he wrote the scripts for The New Adventures of Sherlock Holmes. He acted in 21 films, some uncredited - e.g. he played the Sergeant of the Guard in The Adventures of Sherlock Holmes. British character actor who mainly played dashing or temperamental leads in early British talkies from 1931. Specialised in adventure, crime and horror films. Settled in the United States, mostly playing character roles, for the next years. Appeared on radio shows like Escape and Suspense and also played the minor role of Police Commissioner in the Holmes film The Woman in Green.